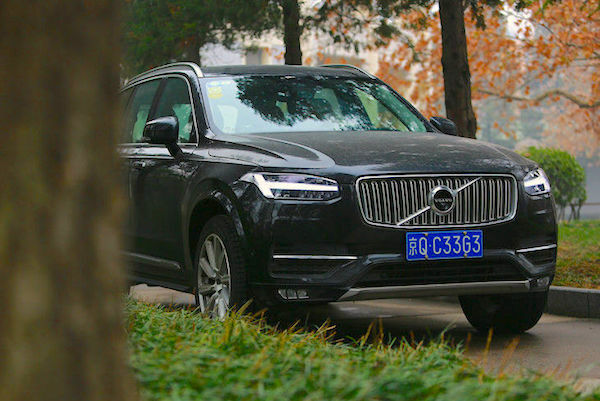 Volvo Chinese imports are up 62% in July thanks to the XC90 (+148%). Complete Chinese imports data is now available for July, BSCB being the first media outside of China to report on these figures monthly. The new tariff situation for new car imports in China is the following: 15% on all imports (instead of 25% up until June 30) except imports coming from the U.S. which are now taxed at 40% as retaliation for Trump’s tariffs on Chinese imports. However what we are looking at here are retail sales which remain globally unaffected by the tariff changes in either direction, as dealership would mostly be clearing out existing stock: imports are actually up 5% year-on-year in July to 95.120, matching the year-to-date 4% uptick to 631.234. The next few months may give us a better indication of the impact of these new tariffs on car imports into China. First surprise in the imported brands ranking: BMW (+12%) takes the lead above Mercedes (-6%) for the first time this year – the last time BMW was the most popular import was in December 2017. Year-to-date, Mercedes (+11%) however remains a comfortable 18.440 units above BMW (-6%). Lexus (+12%) continues to gallop ahead in third place with a YTD uplift at an even more impressive +18%. Excellent month for Porsche (+19%) up four spots on June to #4, distancing Toyota (-9%) while Land Rover soars 30% year-on-year but is knocked down one rank on last month to #6. Volvo (+62%), Lincoln (+20%) and Audi (+15%) also make themselves noticed in the remainder of the Top 10 whereas Volkswagen sinks 18%, the largest decline in the Top 15. Further down, let’s single out Mazda (up 360-fold thanks to the new CX-3 and MX-5), Mitsubishi (+117%), Chrysler (+49%), Rolls-Royce (+48%) and Tesla (+41%). Model-wise, the BMW X5 surges 27% to become the best-selling import for the third time this year after January and February, and takes advantage of a particularly weak month by the traditional leader the Lexus ES (-73%) to also snap the YTD lead with over 31.700 sales (+18%) vs. 30.900 (+0.01%) for the ES. The Lexus NX (+119%) and RX (+50%) complete the podium with spectacular gains, with the NX earning a 4th spot YTD, overtaking the Mercedes GLE (-31%). The Mercedes CLA (+75%) is knocked down one spot on June to #4 despite a hefty uptick and remains at #3 YTD. The Porsche Cayenne (+41%) and BMW 7 Series (+25%) also shine in the Top 10, while below the Toyota Alphard (+330%), Volvo XC90 (+148%), Land Rover Discovery (+113%), Lincoln Continental (+106%) and Porsche Panamera (+69%) are among the most dynamic. The BMW 6 Series GT (#40) leads all recent launches above the Mercedes AMG GLC (#63), Mazda CX-3 (#80) and Audi S4 (#87) new for the month. Full July 2018 Top 50 All imported brands and Top 235 models below. China LCV January-February 2016: Pickups about to bounce back?